This solar power system is a pure DC solar lighting system for homes. It can be used to charge phones and for lighting. 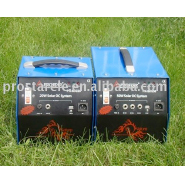 The system box is integrated with battery and charge controller which is powered by a 50W panel. It is portable, comfortable and easy to use and requires very little attention. Full style input and output device without installation and commissioning, simple operation, easy and convenient to use.